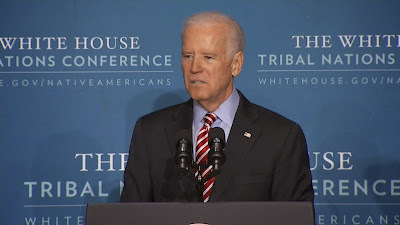 WASHINGTON, DC -- Vice President Joe Biden served up some blunt talk on Saturday, telling Russian President Vladimir Putin simply to "get out of Ukraine." Vice President Joe Biden had tough words for Russian President Vladimir Putin. Biden's comments come at a time of increasing violence in Ukraine, with at least 224 killed and more than 540 injured in the final three weeks of January, according to the U.N. High Commissioner for Human Rights. Speaking at the Munich Security Conference in Germany, Biden said the conflict had moved beyond the need for a "reset" with the relationship, instead requiring a "re-assertion" of the "fundamental bedrock principles on which European freedom and stability rest." Biden met with German Chancellor Angela Merkel and Ukrainian President Petro Poroshenko earlier Saturday to discuss the situation in Ukraine. "We must judge ... any future agreement with Russia by the actions Russia takes on the ground, not by the paper they sign," Biden said. "Given Russia's recent history, we need to judge it by its deeds, not its words. Don't tell us, show us, President Putin. Too many times President Putin has promised peace and delivered tanks, troops, and weapons." While he's echoing much of what White House press secretary Josh Earnest has been saying during recent daily press briefings, neither Biden nor President Barack Obama has weighed in directly this week since tensions escalated. He would not discuss the possibility of U.S. ground troops in the region, but re-asserted the Ukrainian people's right to defend themselves. "We will continue providing Ukraine with security assistance, not to encourage war, but to allow Ukraine to defend itself," he said. "Let me be clear: We do not believe that there is a military solution in Ukraine. Let me be equally clear: We do not believe Russia has the right to do what they're doing." Biden stressed that the United States was not trying to "collapse or weaken the Russian economy" with continued sanctions, but he had a warning for the Russian leader. "President Putin has to make a simple, stark choice," he said. "Get out of Ukraine, or face continued isolation and growing economic costs at home." Merkel is scheduled to visit Washington on Monday. The White House said she will meet with Obama to discuss Ukraine, ISIS and counterterrorism, as well as global economic issues. After the Monday meeting, the two leaders will hold a joint press conference.